Is there anything in life better than leaving the library with a new book? Well, yes, of course. 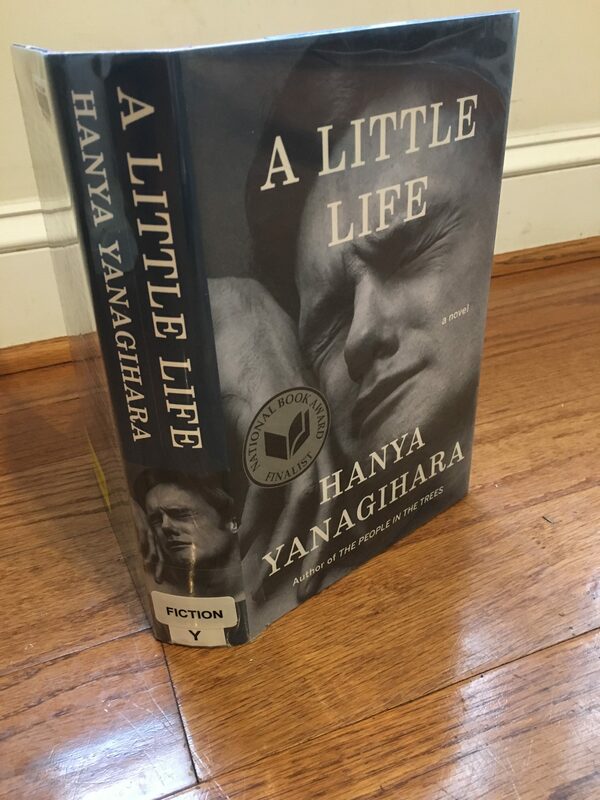 Still, leaving the library with Hanya Yanagihara‘s A Little Life in hand the other day reminded me of a list I have been meaning to put together for decades. This list is supposed to contain life’s simple pleasures. I’m talking about momentary delights, the ones you often overlook but that fill you with pure contentment tinged with possibility. I can only think of a few. Leaving the library with a new book in hand is most definitely one of them. With Thanksgiving in the air, it seems appropriate to think of a few more. My library trip was a simple pleasure in and of itself. It started when I did something I hadn’t done in years: I rode my bike to the library. My computer had told me earlier that a book I had reserved had come available. It was a beautiful fall day, I had no pressing engagements, and I wanted some exercise. So I pedaled to the library, found A Little Life waiting for me, and checked it out. I passed through the book sensors without setting them off and headed to the exit, book in hand and with a definite spring in my step. A rush of hope, contentment, security, and even fulfillment overtook me. For a moment, I was my child self, leaving the library with a pile of new, promising books. Simple pleasures fill you not with ecstacy. Instead, they fill you with a fleeting sense that all is well with the world, and with you. The leap is transitory, but pure. And unlike life’s major triumphs and ecstacies, these simple pleasures do not inevitably come at a cost. These simple pleasures make your heart leap up, just for a moment or two. 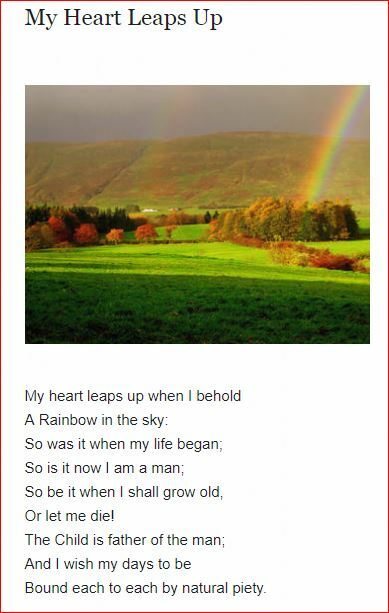 I think Wordsworth was describing one of these moments when he wrote about seeing a rainbow. It is a little thing, a transitory thing, but it makes life worth living. I usually mangle the words. 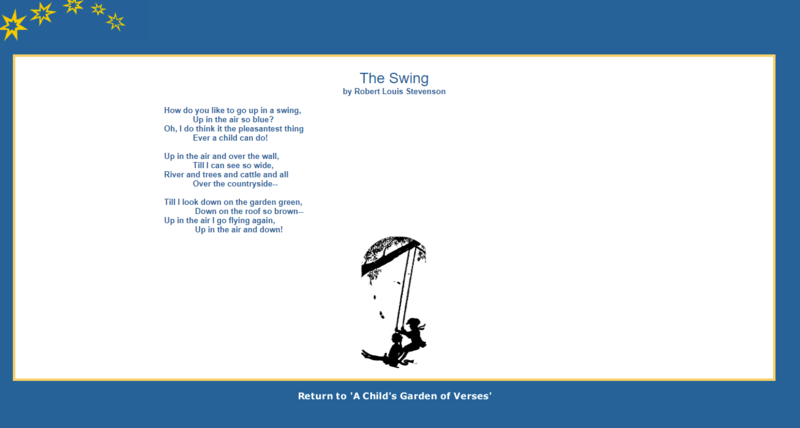 And usually I forget “pleasantest” and say something like “the most marvelous thing” or “the most wonderful thing.” Swinging seems more than pleasant to me, and, clearly, to him. But now I see the poet had it right . These moments, giggle- and squeal-filled or not, are not wondrous or marvelous. They are pleasant. The most pleasant. That is enough. To some extent I feel a rush whenever I enter a bookstore, too. However, that rush is tinged with costs—the costs of buying the books, the sense of so many books and so little time. Walking into the public library certainly fills you with a bit of the latter (although my local library is so tiny that rarely happens). But when you leave with your cost-free catch in hand, that is when the library can’t be beat. That is pure joy. I thank my family for that. When I was a child, my mother would take my brothers and me to the library every week or two. We’d be allowed five books a piece. And every trip was truly like a trip to the candy shop. We could never wait to get back home and dig into our new stash. My mother learned to love libraries from her own mother. Stays with my grandparents always included a trip to the library, where we’d get a stash of books to last us through the visit. My aunt did the same thing whenever we visted her. Having a collection of library books on hand was a way of life for us. Perhaps this is why I get that sense of completion, mission accomplished, when I check out a new book. I don’t know if they will do the same with their own children. I know my daughter takes my two-year-old grandson to the library for story hours and other children’s programs. But whether they have a ritual of bringing a new batch of books home every week or two is beyond me. There are so many other simple pleasures today. I hope some of them are as simple and pure as a trip to the library.